Incredible price and perfectly acceptable performance. Shame those cymbals aren't a tad nicer. The shells are sufficiently round and wrapped neatly enough. You'll be hard pushed to find a half decent starter kit at this sort of price. The specifics of the drums themselves read like classic drum catalogue fare. There's nothing fussy about the shell furniture, but the lugs look classier than they might. The package contains all the bits you need to get cracking. There's not a lot of character or depth going on with the snare, but nothing to complain about. Gear4Music are no strangers to hi-tech retailing - having grown out of music PC specialists Red Submarine. There was a time when the only way to get your hands on musical instruments was to go to a local store, chat through your needs with a friendly sales advisor and plonk your money on the counter. Then telephone mail order arrived, allowing you to buy gear without having to venture outside. Now the internet means you can buy online, in the middle of the night, dressed in your pants and not even have to talk to anyone. There are those who will advise against splashing the cash unless you've tried the instrument in question. How else can you be sure that you're not going to be sent a duff example? Then there's the customer service that only a bricks-and-mortar store replete with staff can offer. But nonetheless, online shopping for music gear has boomed in the last few years, and the very existence of internet retail specialists like Gear4Music is a reflection of that fact. Gear4Music are no strangers to hi-tech retailing. Having grown out of music PC specialists Red Submarine, the company has its roots in internet sales. This is not simply a case of a local dealer with a flash website. As such, the outfit is apparently well positioned to source its own products in the Far East, brand them up and sell them direct, with some remarkable savings as a result. Bypassing the usual big brand distributor middleman means reduced price tags - and sensibly, G4M has focused on the low end of the market for their own brand stuff. 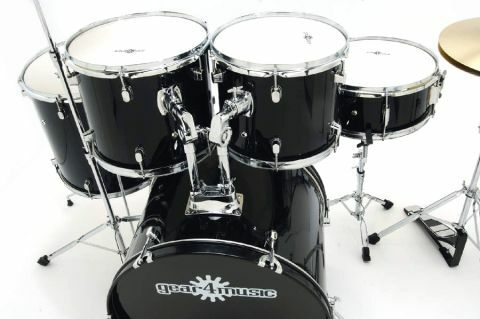 Entry-level drum kits like this one are what it's about, where brand names mean less than incredible value for money. Frankly, you'll be hard pushed to find a half decent starter kit at this sort of price (there's a passing resemblance to other entry-levellers, but these all retail for more than what's being asked here). While the set-up is hardly the last word in refinement, it packs a punch on several levels. The package contains all the bits you need to get cracking - five-piece kit, hi-hat stand, bass drum pedal, snare stand, cymbal stand, stool, sticks and a couple of cymbal-shaped pieces of brass. So you can go from 0-drummer in the time it takes to unpack the box. nothing ground-breaking or innovative going on here, but it's all rock solid stuff. As far as shell material is concerned, details are (as you'd expect) a little hazy. Don't expect to be spoiled by anything other than anonymous 'hardwoods' at this price and you won't be disappointed. Whatever, the shells are sufficiently round and wrapped neatly enough to justify the less-than-£150 price. Likewise, all fixtures and fittings are suitably workmanlike, with the lugs on toms and bass drum doing their best to deliver some pleasing aesthetic appeal. There's nothing fussy about such shell furniture, but the lugs look classier than they might. Even the hardware that comes bundled with the kit is a good deal more impressive than it really has a right to be. Each stand is doubled-braced, and while it doesn't boast the heft of Pearl or Tama's top-end metalwork, the set is worthy of no little praise. There are pointers to its modest nature (a simple protruding screw at the base of the snare stand to arrest movement for example, and weedy, outdated bass drum legs) but in the main this is all perfectly usable. The chain-driven hi-hat and kick pedal are particularly capable performers and the whole lot manages to avoid the kind of wobbling uncertainty of other cheapo kits. Despite the complement of bargain basement shiny white-coated heads that it ships with, the kit actually makes a remarkably acceptable noise. Expectations of the sonic prowess of a set like this are pretty low, but even taking that into account we were nicely surprised by the fact that the toms are less clattery and plasticky than our ears were prepared for. The snare also behaves in a fashion that would befit a drum on the next step up the ladder. It needs a bit of tweaking to get there, and without damping it's a bit wayward, but these things attended to it's actually nice and crisp. There's not a lot of character or depth going on, but nothing to complain about. In fact the only complaint that's (sort of) fair to level at the set-up is the presence of the godawful brass 'cymbals' that come with it. While the drums make a decent fist of getting you started as a player, the cymbals really bear little relation to anything else that bears the name. They're simply clangy, tubby-sounding discs that need dispensing with pretty sharp-ish. But seeing as this kit would be fab value even without them, the hi-hats and 'crash/ride' can be seen as freebies. So it's not right to harp on.